Get ready to start your weight loss journey today. As specialists in digestion, our patients often ask our advice on weight loss and losing fat. Although there are many fad diets and trends, it is rare that we find a weight loss program or innovation that we’re excited about. That’s why we’re so pleased to be able to offer the ORBERA weight loss balloon to Central Florida. The ORBERA balloon, and the weight loss program we offer, is one of the few weight loss methods that we’ve seen work for many of our patients. Our program expands on the success of the balloon itself by giving Florida patients a comprehensive approach to losing weight. We integrate expert coaching and nutritional help through an online aftercare platform and combine that with our compassionate in-office support to all our balloon patients. 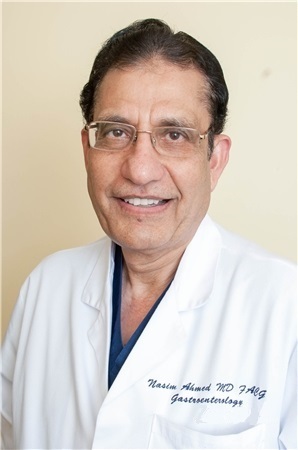 Dr. Ahmed is Central Florida's #1 Orbera provider. He performed 45 Reshape Double Balloon insertion procedures before switching over to the Orbera Single Balloon System. The insertion and removal of the Orbera Balloon is much simpler, better tolerated, and as effective. The ORBERA intragastric balloon is a new, FDA approved, non-surgical approach to weight loss that is proven to help people achieve and maintain significant weight loss. Dr. Ahmed is one of the first GI doctors in the state of Florida to offer this innovative procedure. If you are interested in learning more about the intragastric balloon for non-surgical weight loss, we invite you to call our office at 407-420-7663 to speak with one of our team members about how this may be the right option for you. WHO WOULD BENEFIT FROM THE BALLOON PROGRAM? The ORBERA Procedure was specifically designed for patients with a BMI between 30–40, and may be a good weight loss option for people who do not qualify or do not want to have bariatric surgery. We help patients who are looking for weight loss, increased energy, or an improvement in health. Our most successful patients are those who are looking for an exclusive program, supported by a dedicated team, and are ready to make the lifestyle adjustments that will best support their goals. The ORBERA balloon is placed in your stomach during a quick outpatient procedure. The deflated balloon is placed in your stomach with a scope & filled with saline solution. You’ll be able to go home the same day, at which point you’ll start a 6 month program of weight loss. This program is designed to make you feel empowered and positively supported as you learn from nutrition and fitness experts. We offer a highly customizable, convenient program that includes the ability to take exercise classes on line, and consult live with a nutritionist through video chat from your home. The ORBERA balloon will stay in your stomach for 6 months, at which point we will remove it. Often our patients have reached their weight loss goal at this point, and we work with them for another 6 months to make sure their transition phase is successful. The increased energy and confidence that patients feel after losing weight, combined with our expert coaches, mean many people maintain their weight loss or even continue to lose more weight even after the balloon is removed. WHAT DOES THE BALLOON PROGRAM INCLUDE? The ORBERA balloon program helps you revamp your eating and your lifestyle with expert education and support. To make this easy and convenient for you, we incorporate a FitBit wireless scale and 1 year of online nutrition and lifestyle coaching from experts. Our exclusive program takes the mystery out of weight loss, and gives you tools to finally allow you to find the success you’ve been looking for. If you’re ready to end a cycle of diets that don’t last, and ready to see success from the lifestyle changes you make, ask us about the ORBERA weight loss balloon. With ORBERA, your doctor will gently insert the balloon through your mouth(endoscopically), with no incisions or scars. Unlike weight loss surgeries, ORBERA is not a permanent implant and does not permanently reroute your digestive system. Insertion of the balloon is completed in about 20 to 30 minutes, with no hospital stay required. You can get in and out and on your way to weight loss.